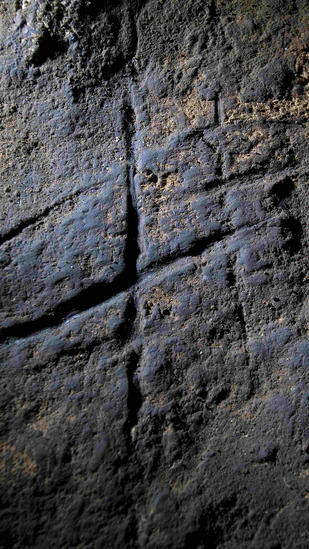 Engravings believed to have been made by Neanderthals more than 39,000 years ago is pictured in Gorham’s Cave, Gibraltar, in this handout photo courtesy of Stewart Finlayson of the Gibraltar Museum. Joaquín Rodríguez-Vidal and his colleagues have found a 40,000 year old pattern scratched in into the floor of a cave in Gibraltar. Is it a doodle, a message or a work of art? We’ve found Neanderthal art before, such as red ochre handprints on cave walls. But this new discovery is some sort of a tic-tac-toe pattern, to which the New Scientist cheekily dubbed them a “hashtag”). The team found the carving in near to many Neanderthal tools, about 300 or so. The researchers ruled out the possibility that the engravings were accidental or from cutting meat or animal skins. Instead, they were made by repeatedly and intentionally using a sharp stone tool to etch the rock, reflecting persistence and determination: one line required at least 54 strokes and the entire pattern as many as 317. “It is a new and even stronger evidence of the Neanderthal capacity for developing complex symbolic thought” and “abstract expression,” abilities long believed exclusive to early modern humans. Ruth Blasco and colleagues discovered an abstract pattern engraved in the rock of Gorham’s Cave in Gibraltar. The cross-hatched pattern was overlain by undisturbed sediment in which Neanderthal artifacts had previously been discovered, suggesting that the engraving pre-dated the 39,000-year-old artifacts. Further geochemical analysis of the mineral coating on the engraved grooves suggests that the rock art was created before deposition of the overlying sediment. The authors took microphotographs of the tool marks within the engraving, compared the marks with experimental marks made with various tools, and determined that the abstract cave engraving was likely created intentionally by repeatedly passing a robust cutting tip over the rock in the same direction, and not by incidental cutting associated with other activities. The results add to evidence at other sites that Neanderthal intellectual capacity may have previously been underestimated, according to the authors. This discovery may be the final piece of evidence that scholars need to convince the entire scientific community that Neanderthals were as intelligent as other humans on the Earth at that time. Reblogged this on Digging up the future….